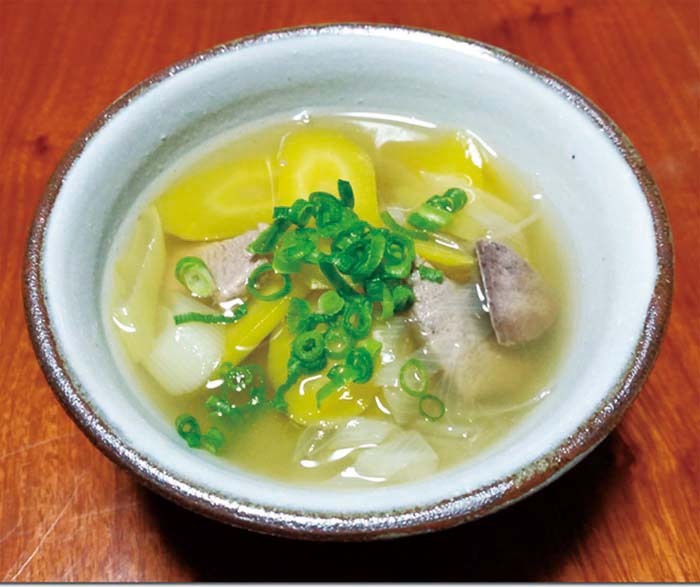 Okinawan people eat “Chimushinji” when they have a cold or fell otherwise sick. Ingredients in this dish include pork that contains proteins, fresh Okinawan vegetables, and herbs with medical properties. Carrots, called ‘shimaninjin,’ are a variety only grown on Okinawa that are yellow in color and skinny and long shaped. The ‘shimaninjin’ season lasts from November through April. 1. Cut pork liver and ham into bite size pieces. 2. Slice shimaninjin and green onion diagonally. 3. Rub a little salt on pork liver pieces and leave it for about 5 minutes, rinse with water. 4. Put pork liver, ham, and shimaninjin in a pot. Add water and bring to a boil. Let simmer about an hour. 5. Once the pork is cooked, add green onion, salt and soy sauce and mix all ingredients gently.